If on paper the Saturday of Move was looking set to be one of those days spent alternating between the bar and clock watching, the reality of it turned out somewhat different. Blessed with a rare day of tropical conditions the venue was transformed into a place where battles were fought and won and ordinary men like you or I became heroes by making that extra run. The photosynthesis effect where people are energized simply by a few rays makes the whole world seem like a brighter place in comparison to the previous day where it was touch and go as to whether torrential rain would pour down on the mascara and Tiara's of Manic's fans. The Bees kicked things of in fine form and although we couldn't name you one song, their brass led summer pop anthems were what everyone needed. Simple songs, sweetly sung vocals, light hip hop beats and the horny stabs of saxophones. It's been done a million times before but who gives a f**k when it's this celebratory. Puressence on the other hand are a band who find beauty in the misery and rain of Northern Towns. With stadium sized anthems such as "This Feeling" and "Standing In Your Shadow", Puressence were a band forever on the brink of success, but despite a fanatical and loyal fanbase they never seemed to make the transition to international superstars. Older material was equal parts Joy Division, The Roses and Early U2, but their latest album "Planet Helpless" seemed disjointed and thankfully today they eschewed this in place of former glories to get them through. James Mudriczki's has the voice of an angel, but not to the extent where other band members are overshadowed. As displayed on the opening and closing tracks "I Suppose" and "India" Puressence are a band in the true sense of the world and it's only when they come together as one that they reach that higher plateau. Today they shone brighter than ever!!! The come back tour of The Inspiral Carpets was one that nobody could have predicted. Playing their cards close to their chests Tom Hingley seemed happy enough fronting the Lovers and Clint Boon was in demand as DJ, but the moment they stepped out on stage at the Manchester Academy back in April it seemed so right. Again back on home turf for Move Festival the band pull out all the stops and deliver a greatest hits set for the loved up Madchester crowd. "Joe", "This Is How It Feels", "Saturn 5", "I Want You" and "Dragging Me Down" are the sort of tunes that have survived the test of time and are still regularly played in indie clubs the length and breadth of the country. While it's a nostalgia trip (the band have announced that their theatre tour in December are set to be the last gigs together) it's never tired or a case of going through the motions. For the time being the guys are just getting a kick out of playing classic songs and the new / old single "Come Back Tomorrow" suggests they've got a potential to reach out to a new younger audience if radio will just give them a chance. In truth most people aren't here to see Dave Gahan solo, but here to hear classic Depeche Mode songs. "Question Of Time", "Walking In My Shoes", "Personal Jesus", "I Feel You" and "Never Let Me Down Again" will go down in history as classic songs, but what riles Gahan is that his own songs from "Paper Monsters" such as "Dirty Sticky Floors" and "Bottle Living" can never compete with the genius of Martin Gore. With Depeche Mode it was all about having a songwriter such as Gore who turned the whole synth movement on it's head, but also having a iconic frontman in Gahan. As a frontman he appears more at home out on his own than he did on the last Depeche Mode tour where rumours were abound that Gore and Gahan didn't speak to each other offstage and it was a musical marriage of convenience. It took a while but by the time he left the stage with the aforementioned "Never Let Me Down Again" he had the crowd eating out of his hands. I've never understood the appeal of Feeder. Just exactly what do they have going for them apart from "Buck Rogers" and "Forget About Tomorrow"? They allegedly convey an emotional depth and sensitivity lacking in rock music, but it's bland coffee table emotions that could never make you cry. Like the Foo Fighters who seem to be the most ordinary band to ever grace the planet, but at the same time manage to reach out to a ever increasing fanbase it seems that little of what I say will make a difference so i'm not going to even bother wasting any more time on a band so devoid of originality. 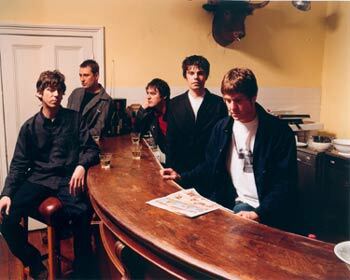 Few headline bands could start a set with a brand new song and their biggest hit, but The Charlatans aren't any band and from the first song they set about proving that they were very much a unit despite the imminent release of Tim Burgess' solo album. "Feel The Pressure" carries along the sleazy funk route of "Wonderland" and is possibly the best song the band have ever written. if you can imagine the tune that Shed 7 tried to write with "Disco Down" and times it by a zillion then your half way to understanding why the song should be number 1 for eternity. The only song that could possibly follow it if "The Only One I Know" and although it possibly got the biggest reaction of the whole set it just didn't come close to competing with the euphoric joy of the aforementioned and unforgettable "Feel The Pressure". A rare outing for "Can't Even Be Bothered" which Burgess announces as a song "where we were influenced by the Cure" and features the glorious refrain of "I can see a rainbow coming out of your soul". From there on it's hits all the way including "One To Another" with it's pounding piano chords, "Just When Your Thinking Things Over", "Love Is The Key", "How High", "North County Boy" and the closing "Sproston Green". Another new song possibly titled "Blue For You" showed a return to a full on aggressive rock sound the band were aiming for. Based around a descending chord progression it's not so much an instant song, but has the feel of one of those great Charlatans growers. With Burgess on form and proving that his heart lies with the Charlatans regardless of his solo album, the band delivered a set which could potentially be the highlight of the weekend.